Used most often in extremely dusty environments such as the mining, desert, and logging industries, Precleaners help to reduce the dust load and extend periods between servicing by lengthening the life of filter elements. 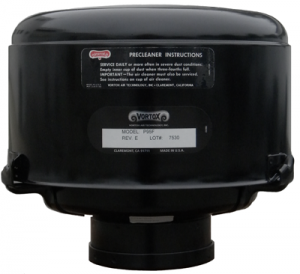 Precleaners attach to an air cleaner’s inlet tube and act as a centrifugal type air cleaner by removing the large particles and greater portion of dust from the air cleaner’s intake air. Vortox Air Technology’s Precleaners feature no gaskets or air seals, which can be broken, and always provide the maximum dust removal efficiency. All Vortox Air Technology Precleaners are entirely fabricated of Carbon Steel and finished with a baked polyester coat to maintain peak performance and durability for years. Current Precleaner diameter sizes are 6″, 8″, 9.5″, and 12″ with inlet sizes ranging from 2″ to 6″. Tube lengths can be modified upon request.